April 24, 2011 - While the National Treasury Employees Union (NTEU) received a significant number of votes in the representation election at the Transportation Security Administration (TSA), there has yet to be a clear winner because no option on the ballot achieved a majority of the votes cast. A runoff election between the top two vote-getters will be conducted. In the first round of voting, which ended earlier this week, NTEU received more than 8,000 votes (or 41 percent) but did not secure the needed majority of 50 percent plus one of the votes cast in order to be declared the winner. A third option on the initial ballot?the choice of no union representation?will not appear on the ballot for the runoff. In the runoff, a simple majority will decide the winner. NTEU President Colleen M. Kelley said NTEU is prepared for a runoff and will continue its assertive nationwide campaign among TSA Officers. She expressed confidence in winning the runoff. 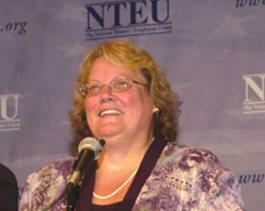 National President Colleen M. Kelley is the leader of the National Treasury Employees Union (NTEU), the nation?s largest independent federal sector union, representing 150,000 employees in 31 separate government agencies. The six-week telephone-online voting period among TSA employees, conducted by the Federal Labor Relations Authority (FLRA) and which concluded yesterday, offered voters three choices: NTEU, another federal union or no union representation. To win outright, one choice had to secure 50 percent plus one vote of all votes cast. NTEU President Colleen M. Kelley said representatives of the contending unions met with officials of the Federal Labor Relations Authority (FLRA) and tentatively agreed that voting instruction materials would be sent to TSA employees on May 23. The voting period will end on June 21, and the votes will be tallied by the FLRA on June 23. The consent agreement has been signed. In the meantime, President Kelley said, NTEU will continue its coordinated, ongoing campaign among TSA Officers at airports, both large and small, emphasizing the successes NTEU has had on behalf of federal employees?and in particular the U.S. Customs and Border Protection (CBP) workforce?over many years. Like TSA employees, many CBP employees work in airports; they have been a visible factor in NTEU?s election efforts to date, and will continue in that role, Kelley said. NTEU has also focused on demonstrating to TSA employees its unique brand of local, on-the-ground representation with on-staff attorneys and labor relations experts located at seven regional field offices around the country. ?NTEU representatives are there in the workplace for our members when and where they need us,? said President Kelley. Earlier this year, NTEU succeeded in its long effort to secure collective bargaining rights for TSA employees; that occurred when TSA Administrator John Pistole issued a determination granting such rights. The next step, President Kelley said, will be to use the administrator?s decision to the best advantage of the TSA workforce by choosing NTEU as its exclusive representative. ?NTEU is widely known and highly-respected for having the best on-the-ground representation and negotiating the best contracts in the federal sector,? President Kelley. NTEU will continue to press these points with TSA Officers during the period leading to the runoff vote. ?It is a message to employees about how best to improve and protect their future,? the NTEU leader said. ?I?m confident that when the runoff election is conducted, TSA Officers will decide that NTEU is best positioned by skill, expertise, structure and the respect it has rightly earned from everyone it deals with, to address both the big-picture and day-to-day workplace issues they face as a key part of the federal workforce. ?